The UC Santa Cruz housing office has worked for 18 months on in-depth West Campus housing plans to make sure the university’s future doesn’t get behind schedule. When the UC Office of the President mandated a student enrollment increase of 10,000 and the addition of 14,000 beds across the UC last November, UCSC’s housing office scrambled to find solutions to house more students. The Porter meadow, along with Family St udent Housing and Kresge College, are slated for renovation and expansion to accommodate future enrollment increases. The housing office is undergoing a maintenance assessment and will begin building as early as next fall. The project’s projected completion is fall 2020. The housing office uses the Long Range Development Plan (LRDP), a continually updated roadmap for development, expansion and construction at UCSC required by the California Environmental Quality Act, as a framework for growth. The updated 2005-2020 plan outlines the accommodation of 19,500 graduate and undergraduate students by 2020 — 2,220 more students than enrolled this fall quarter. Of the additional 10,000 students enrolled UC-wide, 5,000 will join in the fall, and an additional 5,000 over the following two years. However, to accommodate the additional students, UCSC housing is planning to add 600-800 additional beds. Houser said other campuses like UC Santa Barbara, UC Davis and UC San Diego have outlined new building plans in their own LRDPs to accommodate more students. UCSC will enroll 300 more in-state students in fall 2016 than two years ago — 200 freshmen and 100 transfers. Out of the nine UC campuses enrolling more students, UCSC is set to enroll the fewest due to campus and city constraints, like expansion plans with the city to mitigate housing and water impacts. 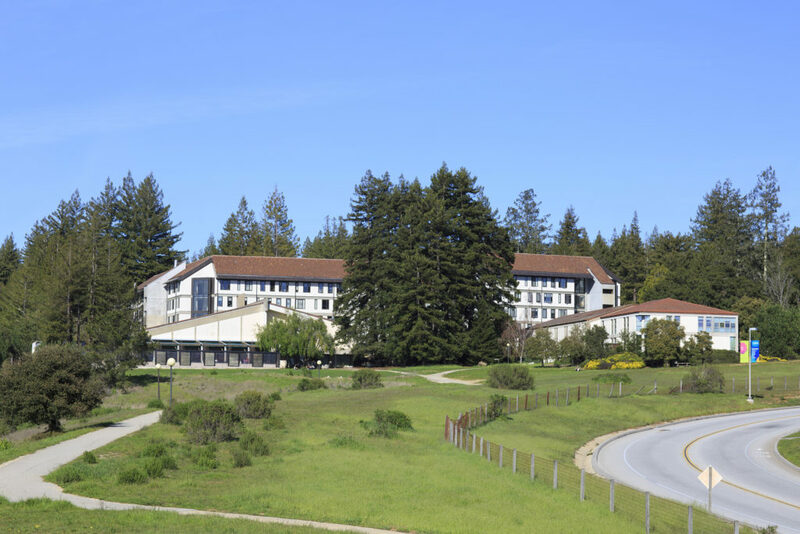 UCSC currently houses 53 percent of all students on campus — the largest percentage at any UC. Housing needs $250 million to build new facilities across West Campus, plus an additional $50 million to repair older buildings like the Crown and Merrill Apartments and Oakes residence halls. The cost of a single bed, including the building’s construction and delivery costs, is estimated at $300,000 with inflation by 2020, Houser said. Beyond the mattress and frame, the cost of each bed space also includes the dorm or apartment space around it. Currently each “bed” in an apartment with four single rooms costs about $180,000. While there are no designs for buildings yet, Houser said student opposition to renovations could impact the cost and projected timeline of the project. Kresge College, originally modeled after Italy’s Tuscany region, is the only college with apartment-style housing and is scheduled to be renovated and rebuilt. Kresge has about 80 double bedrooms that have been converted into triples, Houser said, but no singles have been converted to doubles. The housing office is currently assessing the $120-130 million redevelopment of 350 existing spaces and adding another 100-200 beds. Plans for Kresge College include renovating apartments to remove kitchen and communal spaces to increase the number of beds per unit, as well as new infill construction at “Site B” in the northwestern corner of the college. “Site B” is a small open space containing a basketball court adjacent to the Eco Village. Photo by Stephen De Ropp. Houser said converting doubles and singles is the easiest way to meet demands and get beds available quickly. Since double-to-triple conversions are becoming a UC standard, crowding has become an issue. It costs a third less to live in a triple versus a double room, and Houser said it’s advantageous because students and families are saving about $2,880 annually from triples. Kresge would be best suited for renovation because of its need to increase bed spaces, improve existing floor plans and fix previously deferred maintenance issues. Its apartment units currently house three to eight students and include kitchens, lounge spaces and personal bathrooms. Second-year Kresge affiliate Sierra Surabian suggests building upward, instead of losing some of the key features that make Kresge and UCSC different. “If we have to abide by the [LRDP] why can’t we bring in something unique? Why can’t we have another option that’s still efficient?” Surabian said. The LRDP states if housing isn’t provided, the student population will cap at 19,250 by 2021 and there will be no more enrollment growth. Houser said minimal increases to annual housing rates can cover debt associated with future housing projects. But if bed spaces aren’t built, the cost of construction would need to be paid by fewer students at a higher housing cost. Student Union Assembly (SUA) passed a resolution condemning the proposed UC enrollment increase earlier this month, demanding Chancellor George Blumenthal and other campus leaders denounce it as well. If Blumenthal allows the increase, SUA will call for his immediate resignation. 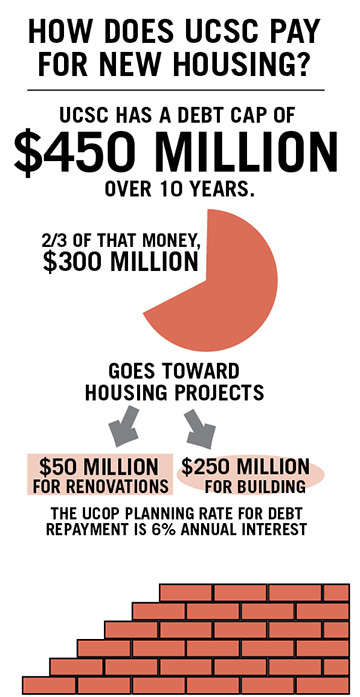 Over the next 10 years, UCSC has a debt cap of $450 million, $300 million of which is allocated to renovating and building housing. Porter College rises up above a site which occupies the 3.7 acres in between the “Porter Squiggle” and the Porter Classrooms. The site is suggested as a possible staging area for development. Photo by Stephen de Ropp. Because UCSC relies on enrollment growth for funding, more students must be admitted to prevent increased debt. To meet class and resource demand, the Division of Undergraduate Education proposed changes to class durations, finals week schedules and time slots — including classes that start at 7:15 a.m. and ones that end at 10:25 p.m.
UCSC has added 2,100 beds since 2004 to accommodate the increase of nearly 3,000 students from fall 2005 to fall 2015. The housing office estimates the average rent for a two-bedroom apartment off campus in Santa Cruz at about $2,000 per month. A report last summer by the National Low Income Housing Coalition ranked Santa Cruz County as the fifth most expensive metropolitan area in the country, with San Jose fourth and San Francisco topping the list. On and off campus, the solution of creating affordable housing options for students in Santa Cruz remains a top concern.